Special thanks to Stefan (HB9TWS) for displaying a banner that shows all solar data available on Windows 8, in either portrait or landscape. Click on this link and follow the download instructions. Updated K7MHI gadget Version 1.5.1.1 for Windows Vista and Windows 7. Click on this link and follow the download instructions. Make sure you UNINSTALL V 1.5.1.0 first or it will not work properly. Making the Windows gadgets work with Windows 8 / 8.1 / 10 using 8GadgetPack (I have heard this works from a number of people but Ihave not tried it as I dont have W8 or above). Use at your own risk. Click on this link and follow the download and setup instructions for the app, then the download instructions for the gadget. Special thanks to Rob (AB1NJ) for making the small data only N0NBH gadget for Windows Vista and W7. Click on this link and follow the download instructions. This one is also mine, in two banners. Refer to the HAMQSL FAQ Page for software download locations and complete instructions. Special thanks to Jan Lategahn (DO5LJ) for making the N0NBH gadget (the horizontal one with solar data, HF conditions, and solar image) that works with Mac OS. Click on this link and follow the download instructions. Special thanks to Petr (OK2CQR) for making any of the available N0NBH gadgets works with Linux OS. Click on this link and follow the download instructions. 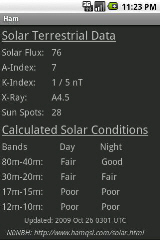 Special thanks to Tom (KE7WTM) for making a HF-Propagation gadget for windows phone 7 (WP7). Contains all the data that the big N0NBH Gadgets have. Tom is using the same exact data I am using for the stickers and gadgets, so it updates every hour as well. Click on this link and follow the download instructions. Special thanks to Paul Picazo (KI6KIK) for making a couple of applications that will run on your iPhone or iPod. The links above are used just like a normal hyperlink for iPhone / iPod touch users on their desktops to find the application. Paul is using the same exact data I am using for the stickers and gadgets, so it updates every hour as well. Partial screenshot is shown at right, for both the iphone and google phone applications. Special thanks to Tom (NS6T) for making the N0NBH gadgets as a WordPress Plugin. Widgets are configurable, allowing the site administer to select which banner to display. Works on WordPress 2.9.2 and should work on previous 2.x versions as well. Click on this link and follow the download instructions. Special thanks to Miro (PA4RM) for making any of the solar panels available as a Joomla CMS extension (becoming very popular). To download the Joomla Solar Panel extension, click on the this link and follow the download instructions. To place on the main page of your BlackBerry, refer to the HAMQSL FAQ Page for software download locations and complete instructions. 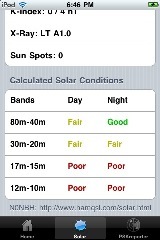 Special thanks to Stew (M0SCU) for tweeting the current solar indicies (SFI, A & K Index, and Sunspots) and solar conditions for the HF bands on twitter at @bandconditions.  I recognize that a lot of you would like to create your own solar terestrial related web information. So, to make it easier, I am offering the data in XML and RSS format. Please be aware, these feeds will last as long as I do not hear grief from my ISP provider. If I do they are gone!! So please only select to update every hour - that is the update period for the flux parameters (rest are 3-hour updates). Credit to HAMQSL.com would be appreciated.